SaaS paradigm is undoubtedly a game changer. The primary characteristic that makes SaaS more attractive for ISVs is the Recurring Revenue Generation, which provides cash flow throughout the year. To handle the entire Recurring billing needs, SaaS products must be equipped to automate the various aspects such as recording usage, generating invoices, collecting payments, security checks, payment audit etc. CelloSaaS introduces an Integrated Billing engine which covers 360° aspects of SaaS recurring Billing Automation. 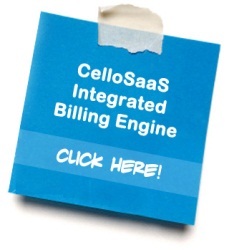 Now customers who want to build or integrate their SaaS offering with CelloSaaS need not build the billing engine by themselves or search for other billing automation Softwares to take care of invoicing their customers. Cello Billing Engine is well integrated with the other Non-Functional SaaS Components such as Tenant Management, Subscriptions, Usage Metering, and Price Plans. This tightly coupled integration makes billing engine so aware of the customer’s information such as Payment mode, pricing plans, their respective tax components, etc., which makes the overall system so seamless. What is Recurring Billing Engine? Recurring Billing Engine is a component which automates the entire process of Recording usage, Raising Invoice (Monthly, Quarterly etc.) based on subscription and pricing plan opted, Applying Tax (Based on Tenant/Region), Automated Payment Collection, Dunning in case of Payment Failure etc. Why we need Automated Billing Solution? Before SaaS era (Licensed Software), Selling software is more or like one time income, but of course they made revenue through other channels like Software Servicing , Maintenance, upgrades, Fixes and Patches; but it was less of a pain when it comes to managing revenue from Customers even if they have 1000 Customers. But with the advent of SaaS and Commodity H/W and S/W, the software Sales revenue was sliced into monthly based pricing because of Pay-as-you-go model. Imagine if a SaaS application has 100 subscribers and considering each of them are in different payment mode(Cash, Check, Credit Card, etc.) and with different payment frequency (1st, 7th, 15th ,30th), with different Tax Policies and with lot more this and that – it simply makes the finance team go mad and when they have too many customers it will only lead to inefficiency. Even if you consider doubling the size of the Finance team it will only lead to more operation expenses and lot more inaccuracies. As long as you have only around 10-20 subscribers, it is fairly easy to manage the recurring payment of your customers, but then if you are a start-up and you can’t afford a separate Finance team, it may be an overhead for your Customer Service team to handle the Financial aspects apart from doing their regular tasks. Once you cross 50 Customers mark, it will be definitely challenging task to manage payment collection from customers. Adding to that, if your product has Freemium support i.e. Trial/ Evaluation mode, it’s going to add lot more difficulty in managing the Payment. Why yet another Billing Engine? We are well aware that, Automated Payment Softwares are overcrowded with established players such as Zuora, Recurly, Chargify to name few, but the challenges with these off the Shelf Softwares are its ability to handle Customized or Complex Billing Requirement, Complexity of integrations, Customizability and most importantly revenue share per transaction imposed commonly by all these s/w vendors. Seamlessly work with other components of the application like metering, security, etc. Cello brings an integrated approach for recurring Billing Solution along with other non-functional components offered by Cello for building SaaS and Multi-Tenant Applications. When compared to out of the box Billing Solutions, Cello provides 360° degree support for the entire application i.e. Cello directly ties Billing Engine with other components i.e. Subscription, Tenant Management, Pricing, Trial & Evaluation, Free Look up Period, Trial to Paid Conversion, Automated and Manual Payment, Business Policies, Upgrades and Downgrade, Pro-Ration, Dunning etc.